South Portland’s Enio’s Eatery opened in 2013 when co-owners Robert and Laura Butler who previously owned Rachel’s in Portland came back from a brief stay in Florida to open another restaurant. My wife and I often pass by and smell the odor of delightful Italian food. When she suggested a visit I figured it was as good a time as any to see if the food was actually delicious or if they were just pumping out aural emanations of the finest kind while serving up mediocre meals. We made reservations and arrived at the predetermined time. The restaurant was small with a few tables, a typical bar, and a bar/shelf/table that ran the full length of the restaurant and looked out the window to the street. It was an unusual set-up but definitely gave a quaint neighborhood feel that I found appealing. We were given a choice of where to sit – minus a few seats that were already reserved – and decided to sit at the bar. I had previously viewed the menu that was online, but when I received the one at the restaurant, it was somewhat different. I started to peruse it. While I did so, the bartender/owner took our drink orders. My wife ordered wine and asked for some bread – which is served by request – and I passed on another beverage in favor of my water. We were also given a few specials, but none of them piqued my interest. They sounded good, but the menu items looked like they were the catch of the night for me. The first thing on the menu were jars and grilled bread – essentially a jar of spread with some delicious bread. After a brief look at the menu though, I was set on a starter of either bruschetta or buffalo mozzarella. I asked the ol’ ball and chain if she wanted to share one and she responded in the affirmative. 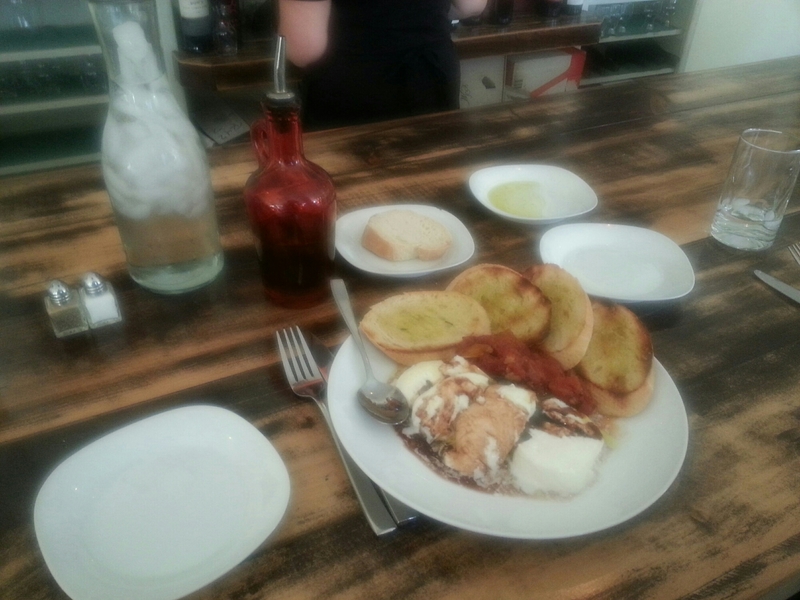 We decided on the Imported Bufula Mozzarella – roasted tomato confit, basil, balsamic drizzle, fett’unta. I let her think it was her decision, but I wanted that anyway. I grinned a bit at the thought of some cheese love and moved on to choosing the next part of my meal. Entrees on the menu came in the form of pasta or wood grilled items. I don’t usually order pasta when I go out, but I was at an Italian restaurant and had a bit of a hankering for the carbohydrate confetti. After considering a few items, the one that finally caught my eye was handmade cavatelli with rapini, braised house made sausage, and marsalla wine. The sausage sold me on the dish as did the handmade pasta though I was a little nervous about the rapini due to my dislike of cooked, leafy greens. I knew it was the one for me though. Mrs. Portlandeater went with the braised chicken with pasta in a light, creamy tomato broth with peas, mushrooms, and carrots. My wife’s wine made an appearance and so did our bread. The bread was delicious with a little olive oil drizzled on some salt and pepper. I ate way too much of that while I sipped water and my wife sipped wine. We anxiously awaited our starter and spoke of things better left unsaid. Once we said the things that were better left unsaid, we finished our bread and were hulking up for the meal that was about to arrive. It didn’t take long at all for the mozz to come out. In fact, the service was downright prompt. It looked great and smelled even better. There were four fett’unta or “toasted bread of considerable heft” as I preferred calling them. The tomato confit was laced with garlicky goodness. The cheese was colored by balsamic. I was drooling. I grabbed a slice of the bread and proceeded to smash both the tomato and mozzarella onto it in a fit of excitement. After proper smashing was completed, I proceeded to place a bite into my buffalo mozzarella hole and see where it took me. By the gods of grassy knolls and interweb trolls! This was magnificent. As my wife mumbled something about “best thing I’ve eaten in a long time”, I tried to shove the crunchy, sweet, ultra garlicky concoction with just the right amount of acidity into my face. It was pure joy and by far the best buffalo mozzarella I ever laid my mouth upon. After gorging on the good stuff, we awaited our meals, incredibly pleased with what we had eaten so far. It was quicker than we expected when we received our main courses. Like our appetizer, they looked and smelled great. Both dishes came garnished with some sprinkled cheese and green onion. All ingredients in the dishes were well represented. I picked up my fork and tried a bite. The cavatelli was deliciously doughy – just how I like it. The sauce was excellent and the sausage was superb – not particularly spicy, but well seasoned and definitely accessible to all tastes. I didn’t love the rapini, as expected, but I did eat some and pushed the rest aside so I could focus on the other awesome parts of the dish. As I stuffed my face with reckless abandon, my wife kept offering me part of her food which she insisted was excellent. When I finally finished my meal, I dug into hers. I got a bite of pasta, chicken, and vegetables. Holy holy, holy sheet! It was righteously cheesy, blissfully buttery, and compellingly creamy. The chicken was more tender than the sweetest little newborn baby asleep and curled up next to a puppy. This was a masterpiece of pastanomic proportions. I had several bites and declared that I was finished. Wow. Happiness was already pouring out of me, but I figured I could possibly squeeze in some dessert. We checked on the options at the restaurant which sounded great, but we already had dessert waiting for us at home in the form of Mrs. Portlandeater’s master baking. We passed on the sweet stuff and asked for the bill. Including tax and tip, the meal came to 83 smackers. It was well worth it. The meal was really outstanding and this is definitely a place I will go back to. I loved the neighborhood feel, the atmosphere, and of course, the food. Check them out! You won’t be disappointed unless you have mutant tastebuds. This entry was posted in Portland, ME food on May 31, 2015 by peterpeterportlandeater. A cool First Friday art walk led us to our next in what has been a short string of local noodle bar visits. First was the Japanese, then the Vietnamese, and this one – Mi Sen – was Thai. I haven’t really tired of noodle bars as they satisfy my Asian food cravings which never really seem to go away. I was ready to try a new one and see exactly what they had to offer. I thought a brief perusal of the menu prior to arrival had me primed and ready to get down to business right away, but it turned out I was wrong and didn’t make such a quick decision when that time came. This night, we would require a table for four since we were with some friends. We sat in the half-full restaurant and immediately began to look at the menus. I was going alcohol-free, but the others quickly decided on an assortment of beer and wine. The waitress took those orders and we worked on getting the food choices settled. Even though I had a predetermined set of foods I wanted to order, I still had to discuss it with my wife because I wasn’t 100% certain yet. The menu was extensive with a full list of apps, noodle bowls, and entrees and I sort of wanted to try them all. There was a full-on food debate at the table until our first courses were clearly defined and put in with the waitress. I decided to get the Gyoza – pan-fried pork dumplings with sweet soy sauce and also some Crab Rangoons with sweet sauce to share with my wife. Our counterparts ordered Radish Cakes – steamed radish cakes with peanuts and mushrooms served with sweet chili soy sauce. I went with the Tom Yum Num Sai with Chicken – clear chicken broth with a touch of chilies and lime, ground chicken, bean sprouts, green beans, peanuts, chili powder, scallions, cilantro, and crispy wonton sheet with thin rice noodles. My buddy put in for the Num Sai with Tofu – clear broth made with chicken stock, ground chicken, bean sprouts, green beans, scallions, cilantro, and crispy wonton sheet with thin rice noodle and a Thai Iced Tea. He ordered the soup extra hot. We waited for a bit while discussing all manner of topics including riffs, bands, and struts and sipping beverages. We also put in our orders for main courses. 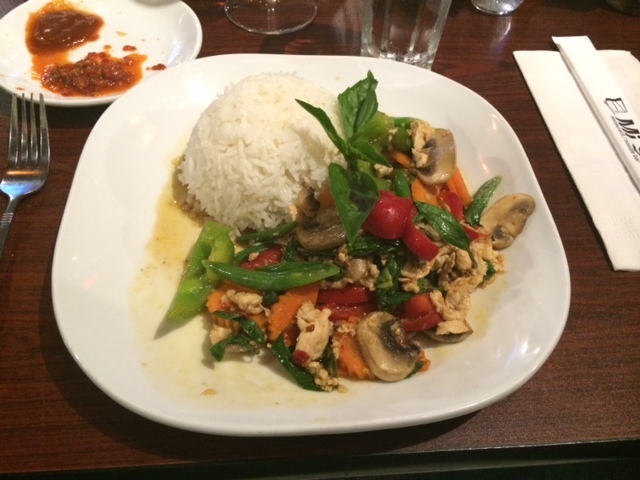 I ordered one of my favorites – Chicken Pad Kra Pow with Rice – spicy stir-fried basil leaves, bell peppers, carrots, green beans, mushrooms, fresh chilies, garlic. My wife ordered one of her preferred dishes too – Drunken Noodle with Chicken – stir-fried flat noodles with egg, broccoli, bell peppers, basil leaves, bamboo shoots, carrots, spicy sauce. Rounding out the table were Dry Noodle with Tofu – boiled noodles mixed in spicy and sour sauce, chili, peanuts, scallions, cilantro, and crispy wonton sheet and Thai Curry with Rice with Tofu – creamy green curry with basil leaves, bell peppers, green beans, and eggplant with a side of rice. After we placed those orders, our apps and soups came out. I couldn’t wait to dig into the gyoza. I forked one into the sweet soy sauce. The sauce was very thick, akin to honey on a warm day. Immediately after dunking the dumpling I chomped on it. Whoa! The dumplings were good, but the sauce was very sweet and the full immersion of my dumpling oversauced it. I was on sweet sauce overload. I recovered and eased up on it for my next one. It was much better. I actually think a lot of people would like the heavy sauce, but for me it was better in small doses. Next, I tried a rangoon with some of the sauce. I tend to not like sauces that come with rangoons, but this one wasn’t bad. What really wowed me though was the rangoon itself. The real crab meat took it to the next level as it always does. These were outright winners and the missus loved them too. Next up was a soup sampling and I was ready to chew and slurp my way into it. I tried a few bites of my Tom Yum Num Sai – first broth, then some of the meat and veggies. It wasn’t super flavorful since it had the clear broth, but I could taste a hint of the lime which worked well with the slightly-more-present chilies. It was also quite hearty with plenty of the more heavy ingredients. Overall, it was good, but if you’re looking for non-heat flavor in a broth that gets up in your face, this wasn’t it. Order it though if you want something hearty and with some heat. If you want extra heat, just ask. My counterpart was crying through his extra hot noodle bowl. You can also heat it up yourself with their sriracha or garlic chili sauce. At this point, everyone seemed quite happy with the food and soon we had the entrees. I was close to being full already and was a bit nervous that I would hardly be able to delve into my meal. When I got my tongue-twisting plate of Pad Kra Pow, it looked quite familiar, so I had high hopes. I tried a rip of my food. It was delicious – flavorful, spicy, and sauced so that the rice could be par-soaked in the juices. Unfortunately, I was indeed too full to consume more than half of my meal, so I finished and watched everyone else eat. Of course, I took the rest home for a future session of enjoyment. After stuffing our faces, all four of us were quite pleased. I made some mental notes for the next time I was there. First, I have to go easy on the sweet soy sauce. Unless you are an absolute sweet-o-holic, you’ll want to go light on the stuff too. If you want mild flavor, but still a solid portion of spicy, order the Tom Yum Num Sai, but for something with a more potent broth, choose one of the soups with a flavored broth. Also, next time, I’ll use the sauces more. I tried them both and they were absolutely excellent. If you want heat and flavor, douse your food with those. I’ll definitely be back to Mi Sen. The food was good and the prices are very reasonable. Our meal came to just over $50 after tip. There’s still a lot I want to try there, so next time, I’ll definitely get something completely different. I must say too that the food I brought home was even better the next day when I wasn’t overly full. See for yourself. Go and order a bunch of items like me, so you can have some left over to enjoy later. This entry was posted in Portland, ME food on May 13, 2015 by peterpeterportlandeater.